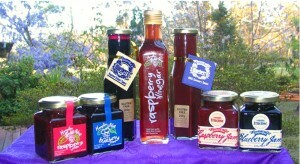 Here’s a quick snap of the homemade blueberry and raspberry products we currently sell! Everyone gets a product. I love the blueberry jam, Kirst loves the blueberry BBQ sauce, the kids love the raspberry coulis, mum can’t stay away from raspberry vinegar on her salads and dad’s the raspberry jam man. That leaves Ed and he simply takes the lot on!